Alaska Governor Sean Parnell addresses the group at PNWER's 23rd Summit in Anchorage, 2013. You're invited to the Pacific NorthWest Economic Region (PNWER) Annual Summit in Whistler, British Columbia from July 20 - 24, 2014. PNWER is the only statutory, non-partisan, bi-national, public / private partnership in North America, with goals of strengthening relationships, finding cross-border solutions to common challenges, and advocating for regional interests. 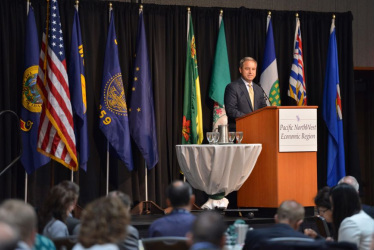 In its 24th year, the PNWER Annual Summit brings together over 500 key business leaders, legislators, and government leaders from PNWER's ten states, provinces, and territories to address the major policy issues impacting the region. Previous PNWER Summits have been held in Anchorage, Saskatoon, Portland, Calgary, Boise and many other memorable places within the region. Click here to learn more about Whistler, B.C. Click here to learn more about PNWER.